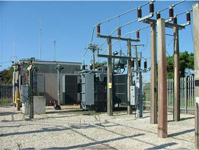 Substations are where electricity lines are connected and switched and where the voltage is changed by transformers. They range from the very large to the very small - see below for a guide. But in nearly all cases, the highest field is usually produced by the lines and cables supplying the substation and not by the equipment inside the substation itself. If the substation itself produces a field outside its perimeter, it usually falls away over the first few metres. We give more detail of the fields from different types of substations. In each case click on the link for more details of the field it produces. These are large substations where 400 kV and 275 kV lines are switched and electricity is transformed down to the next voltage, 132 kV. A sealing end compound is where an overhead line joins on to an underground cable. 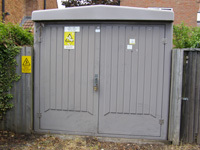 It looks a bit like a small substation, surrounded by a metal fence, but does not contain any transformers or switchgear. These are like National Grid substations but smaller and transform electricity between 132 kV, 33 kV and 11 kV. They produce fields in a similar way to a National Grid substation, only generally at a lower level reflecting the lower voltages and smaller sizes. Indoor - built into a small building which may look like a garage, or as part of a bigger building. The clue is the safety sign on the door. 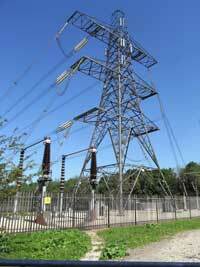 This is the one type of substation which can sometimes give markedly raised magnetic fields beyond its own confines. Cabinet - built into a fully-enclosed cabinet. Outdoors - the separate components are mounted on the ground and enclosed by a metal or wooden fence. Pole-mounted - the transformer is raised above ground on a wood pole. In addition there were 349,000 pole-mounted 11 kV/400 V transformers. 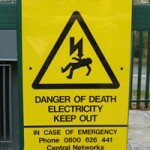 Substations and pylons carry warning notices warning of the dangers of electrocution - this is nothing to do with EMFs.